"I'm going to make you work hard," a blonde and perfectly muscled fitness instructor screamed at me in a recent spinning class, "so you can have that second drink at happy hour!" 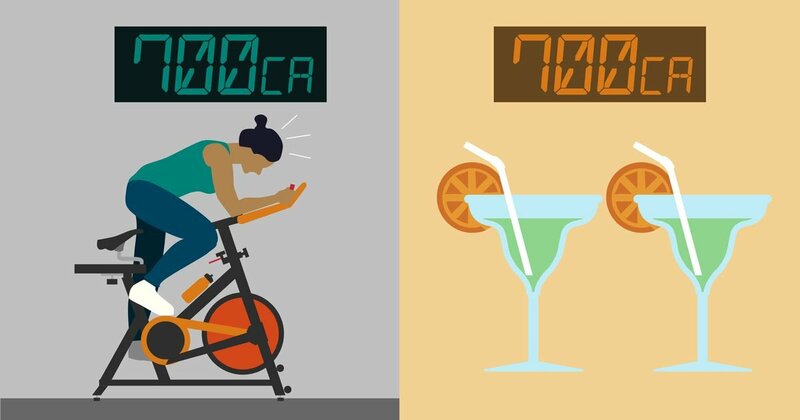 The spinning instructor was echoing a message we've been getting for years: As long as you get on that bike or treadmill, you can keep indulging — and still lose weight. It's been reinforced by fitness gurus, celebrities, food and beverage companies like PepsiCo and Coca-Cola, and even public health officials, doctors, and the first lady of the United States. Countless gym memberships, fitness tracking devices, sports drinks, and workout videos have been sold on this promise. There's just one problem: This message is not only wrong, it's leading us astray in our fight against obesity. To find out why, I read through more than 60 studies on exercise and weight loss. I also spoke to nine leading exercise, nutrition, and obesity researchers. Here's what I learned. When anthropologist Herman Pontzer set off from Hunter College in New York to Tanzania to study one of the few remaining hunter-gatherer tribes on the planet, he expected to find a group of calorie-burning machines. Unlike Westerners, who increasingly spend their waking hours glued to chairs, the Hadza are on the move most of the time. Men typically go off and hunt — chasing and killing animals, climbing trees in search of wild honey. Women forage for plants, dig up tubers, and comb bushes for berries. "They're on the high end of physical activity for any population that's been looked at ever," Pontzer said. 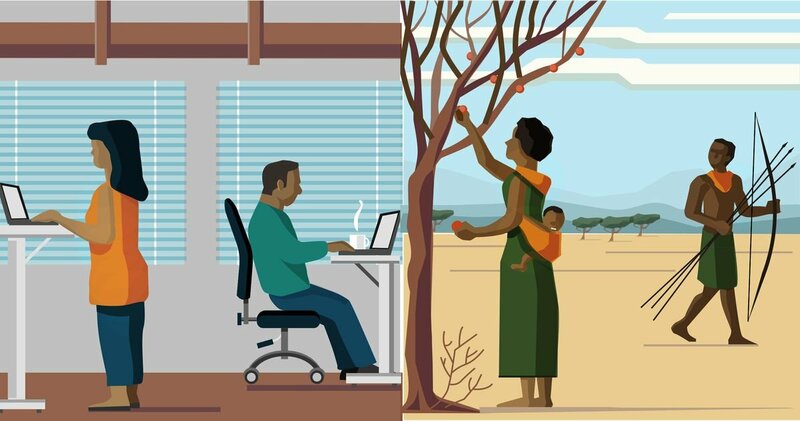 By studying the Hadza lifestyle, Pontzer thought he would find evidence to back the conventional wisdom about why obesity has become such a big problem worldwide. Many have argued that one of the reasons we've collectively put on so much weight over the past 50 years is that we're much less active than our ancestors. Surely, Pontzer thought, the Hadza would be burning lots more calories on average than today's typical Westerner; surely they'd show how sluggish our bodies have become. In the dry, open terrain, they found study subjects among several Hadza families. For 11 days, they tracked the movements and energy burn of 13 men and 17 women ages 18 to 75, using a technique called doubly labeled water — the best known way to measure the carbon dioxide we expel as we burn energy. "We were really surprised when the energy expenditure among the Hadza was no higher than it is for people in the US and Europe," says Pontzer, who published the findings in 2012 in the journal PLOS One. While the hunter-gatherers were physically active and lean, they actually burned the same amount of calories every day as the average American or European, even after the researchers controlled for body size. Pontzer's study was preliminary and imperfect. It involved only 30 participants from one small community. Or maybe the Hadza were resting more when they weren't hunting and gathering to make up for all their physical labor, which would also lower their overall energy expenditure. If the "calories out" variable can't be controlled very well, what might account for the difference in the Hadza's weights? "The Hadza are burning the same energy, but they're not as obese [as Westerners]," Pontzer said. "They don't overeat, so they don't become obese." This fundamental concept is part of a growing body of evidence that helps explain a phenomenon researchers have been documenting for years: that it's extremely difficult for people to lose weight once they've gained it by simply exercising more. Before we dive into why exercise isn't that helpful for slimming, let's make one thing clear: No matter how working out impacts your waistline, it does your body and mind good. A Cochrane Review of the best available research found that while exercise led to only modest weight loss, study participants who exercised more (even without changing their diets) saw a range of health benefits, including reducing their blood pressure and triglycerides in their blood. Exercise reduces the risk of Type 2 diabetes, stroke, and heart attack. A number of other studies have also shown that people who exercise are at a lower risk of developing cognitive impairment from Alzheimer's and dementia. They also score higher on cognitive ability tests — among many, many other benefits. If you've lost weight, exercise can also help weight maintenance when it's used along with watching calorie intake. In an October 2017 study published in the journal Obesity, researchers examined what happened to 14 of the contestants on the Biggest Loser weight loss reality show, six years after they attempted to slim down for TV. They again found there was no relationship between physical activity and weight loss during the active weight loss of the show. "Consistent with previous reports, large and persistent increases in [physical activity] may be required for long-term maintenance of lost weight," the researchers concluded. So exercise, in summary, is like a wonder drug for many, many health outcomes. Consider this review of exercise intervention studies, published in 2001: It found that after 20 weeks, weight loss was less than expected, and that "the amount of exercise energy expenditure had no correlation with weight loss in these longer studies." To explore the effects of more exercise on weight, researchers have followed everybody from people training for marathons to sedentary young twins to post-menopausal overweight and obese women who ramp up their physical activity through running, cycling, or personal training sessions. Most people in these studies typically only lost a few pounds at best, even under highly controlled scenarios where their diets were kept constant. Other meta-analyses, which looked at a bunch of exercise studies, have come to similarly lackluster conclusions about exercise for losing weight. This Cochrane Review of all the best available evidence on exercise for weight loss found that physical activity alone led to only modest reductions. Ditto for another review published in 1999. University of Alabama obesity researcher David Allison sums up the research this way: Adding physical activity has a very modest effect on weight loss — "a lesser effect than you'd mathematically predict," he said. 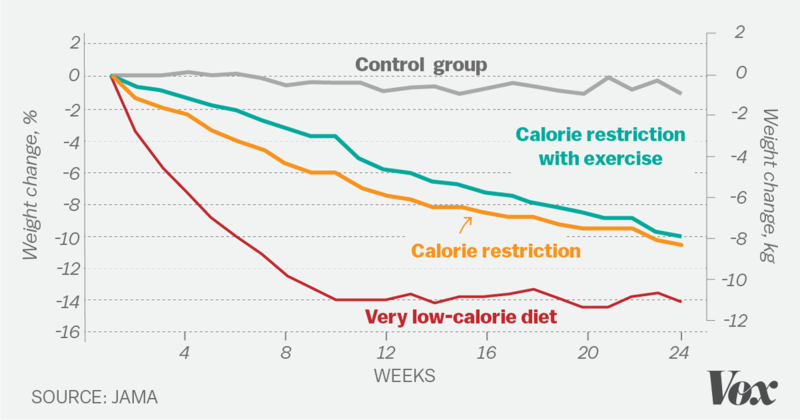 We've long thought of weight loss in simple "calories in, calories out" terms. In a much-cited 1958 study, researcher Max Wishnofsky outlined a rule that many organizations — from the Mayo Clinic to Livestrong — still use to predict weight loss: A pound of human fat represents about 3,500 calories; therefore, cutting 500 calories per day, through diet or physical activity, results in about a pound of weight loss per week. Similarly, adding 500 calories a day results in a weight gain of about the same. Today, researchers view this rule as overly simplistic. They now think of human energy balance as "a dynamic and adaptable system," as one study describes. When you alter one component — cutting the number of calories you eat in a day to lose weight, doing more exercise than usual — this sets off a cascade of changes in the body that affect how many calories you use up and, in turn, your bodyweight. One very underappreciated fact about exercise is that even when you work out, those extra calories burned only account for a tiny part of your total energy expenditure. "In reality," said Alexxai Kravitz, a neuroscientist and obesity researcher at the National Institutes of Health, "it’s only around 10 to 30 percent [of total energy expenditure] depending on the person (and excluding professional athletes that workout as a job)." 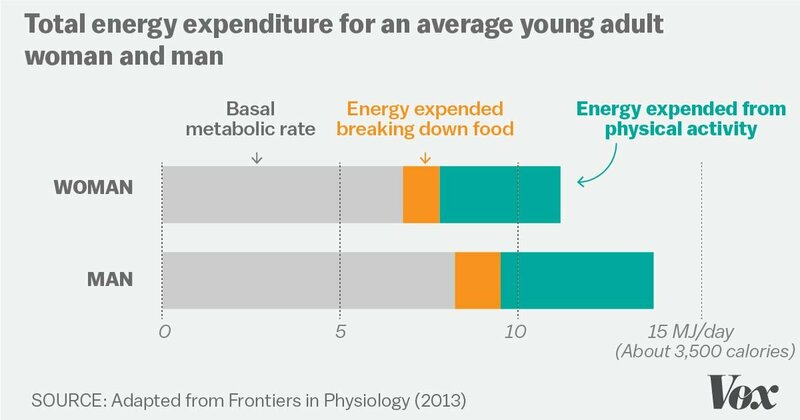 We have very little control over our basal metabolic rate, but it's our biggest energy hog. "It's generally accepted that for most people, the basal metabolic rate accounts for 60 to 80 percent of total energy expenditure," Kravitz said. Digesting food accounts for about 10 percent. "It's not nothing, but it's not nearly equal to food intake — which accounts for 100 percent of the energy intake of the body," Kravitz said. "This is why it's not so surprising that exercise leads to [statistically] significant, but small, changes in weight." Using the National Institutes of Health Body Weight Planner — which gives a more realistic estimation for weight loss than the old 3,500-calorie rule —the NIH's Kevin Hall created this model to show why adding a regular exercise program is unlikely to lead to significant weight loss. That's why Hall thinks researchers find again and again that exercise can help maintain weight loss, but it doesn't help people lose weight. "You need a huge volume of exercise to [burn enough calories for weight loss]," he said. "But to maintain weight loss does not require a deficit of energy." Exercise can even undermine weight loss in subtle ways. How much we move is connected to how much we eat. As Hall put it, "I don't think anybody believes calories in and calories out are independent of each other." And exercise, of course, has a way of making us hungry — so hungry that we might consume more calories than we burned off. "You work hard on that machine for an hour, and that work can be erased with five minutes of eating afterward," Hall added. A single slice of pizza, for example, could undo the calories burned in an hour's workout. So could a cafe mocha or an ice cream cone. There's also evidence to suggest that some people simply slow down after a workout, using less energy on their non-gym activities. They might decide to lie down for a rest, fidget less because they're tired, or take the elevator instead of the stairs. These changes are usually called "compensatory behaviors," and they simply refer to adjustments we may unconsciously make after working out to offset the calories burned. 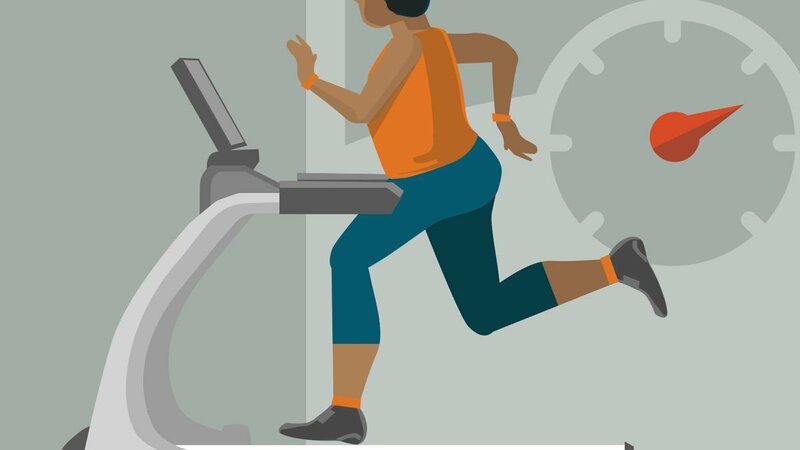 The most intriguing theories about why exercise isn't great for weight loss describe changes in how our bodies regulate energy after exercise. Researchers have discovered a phenomenon called "metabolic compensation." "The more you stress your body, we think there are changes physiologically — compensatory mechanisms that change given the level of exercise you're pushing yourself at," said Loyola University exercise physiologist Lara Dugas. In other words, our bodies may actively fight our efforts to lose weight. For one fascinating study, published in the journal Obesity Research in 1994, researchers subjected seven pairs of young, sedentary identical twins to a 93-day period of intense exercise. For two hours a day, nearly every day, they'd hit a stationary bike. The twins were also housed as inpatients in a research lab under 24-hour supervision and fed by watchful nutritionists who measured their every calorie to make sure their energy intake remained constant. By way of explanation, the researchers wrote that either subjects' basal metabolic rates slowed down or subjects were expending less energy outside of their two-hour daily exercise block. In a more recent study, published in Obesity in May 2016, Kevin Hall's group again looked at 14 of the Biggest Loser reality show participants. They took a number of measurements — bodyweight, fat, metabolism, hormones — at the end of the 30-week competition in 2009, and again six years later, in 2015. Though all the contestants lost dozens of pounds through extreme diets and hours of exercise at the end of the show, by the six-year mark their waistlines had largely rebounded. But the most remarkable finding was that the participants' metabolisms had vastly slowed down through the study period. They were essentially burning about 500 fewer calories (about a meal's worth) each day than would be expected given their weight. This metabolic effect persisted, despite the fact that most participants were slowly regaining the weight they lost. Dugas calls this phenomenon "part of a survival mechanism": The body could be conserving energy to try to hang on to stored fat for future energy needs. Again, researchers don't yet know why this happens or how long the effects persist in people. "We know with confidence that some metabolic adaptions occur under some circumstances," said David Allison, "and we know with confidence some behavioral compensations occur under some circumstances. We don't know how much compensation occurs, under which circumstances, and for whom." Another hypothesis about why it's hard to lose weight through exercise alone is that energy expenditure plateaus at a certain point. In another Pontzer paper, published in 2016 in the journal Current Biology, he and his colleagues found evidence of an upper limit. "After adjusting for body size and composition," the researchers concluded in the study, "total energy expenditure was positively correlated with physical activity, but the relationship was markedly stronger over the lower range of physical activity." In other words, after a certain amount of exercise, you don't keep burning calories at the same rate: Total energy expenditure may eventually plateau. "That plateau is really different than the standard way of thinking about energy expenditure," Pontzer said. "What the World Health Organization and the people who build the Fitbit would tell you is that the more active you are, the more calories you burn per day. Period, full stop." Based on the research, Pontzer has proposed a new model that upends the old "calories in, calories out" approach to exercise, where the body burns more calories with more physical activity in a linear relationship (also known as the "additive" model of energy expenditure). 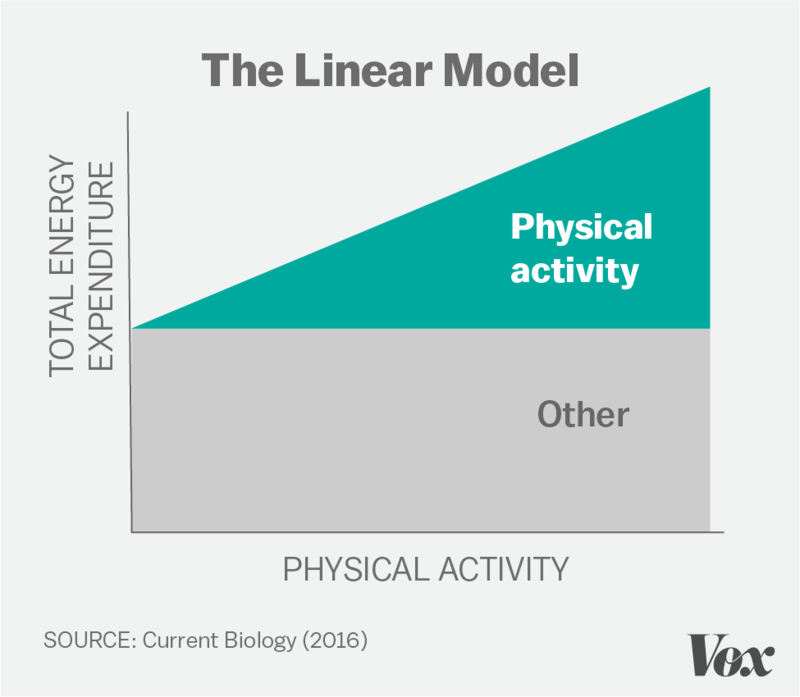 He calls this the "constrained model" of energy expenditure, which shows that the effect of more physical activity on the human body is not linear. In light of our evolutionary history — when food sources were less reliable — he argues that the body sets a limit on how much energy it is willing to expend, regardless of how active we are. "The overarching idea," Pontzer explained, "is that the body is trying to defend a particular energy expenditure level no matter how active you get." This is still just a hypothesis. Pontzer and others will need to gather more evidence to validate it, and reconcile contradictory evidence showing that people can burn more energy as they add physical activity. So for now it's a fascinating possibility, among all the others, that may help explain why joining a gym as a sole strategy to lose weight is often an exercise in futility. Since 1980, the obesity prevalence has doubled worldwide, with about 13 percent of the global population now registering as obese, according to the WHO. In the United States, nearly 70 percent of the population is either overweight or obese. A lack of exercise and too many calories have been depicted as equal causes of the crisis. But as researchers put it in an article in BMJ, "You cannot outrun a bad diet." "Physical activity is vital to the health and well-being of consumers," Coca-Cola says. The company has been aligning itself with exercise since the 1920s, and was recently exposed by the New York Times for funding obesity researchers who emphasize a lack of physical activity as the cause of the epidemic. Coca-Cola is just one of many food companies that are encouraging us to get more exercise (and keep buying their products while we're at it): PepsiCo, Cargill, and Mondelez have all emphasized physical activity as a cause of obesity. The exercise myth for weight loss also still appears in high-profile initiatives, like the former first lady Michelle Obama's Let's Move campaign — largely because of the food industry's lobbying efforts, according to Marion Nestle, a New York University nutrition professor. The White House's exercise focus to end childhood obesity, Nestle said, was "a strategic decision to make the message positive and doable and, at the same time, keep the food industry off its back." But this focus on calories out, or the calories we can potentially burn in exercise, is "an inadequate and a potentially dangerous approach, because it is liable to encourage people to ignore or underestimate the greater impact of energy-in," an obesity doctor and professor wrote in the journal Public Health Nutrition. In other words, we can lose sight of the fact that it's mostly too much food that's making us fat. "There are all kinds of reasons to exercise that are good for your health," says Diana Thomas, a Montclair State University obesity researcher. "However, if you're trying to lose weight, the biggest problem I see is food. We need to cut back the food we're eating." The evidence is now clear: Exercise is excellent for health, but it's not important for weight loss. The two things should never be given equal weight in the obesity debate. At the individual level, some very good research on what works for weight loss comes from the National Weight Control Registry, a study that has parsed the traits, habits, and behaviors of adults who have lost at least 30 pounds and kept it off for a minimum of one year. They currently have more than 10,000 members enrolled in the study, and these folks respond to annual questionnaires about how they've managed to keep their weight down. The researchers behind the study found that people who have had success losing weight have a few things in common: They weigh themselves at least once a week. They restrict their calorie intake, stay away from high-fat foods, and watch their portion sizes. They also exercise regularly. But note: These folks use physical activity in addition to calorie counting and other behavioral changes. Every reliable expert I've ever spoken to on weight loss says the most important thing a person can do is limit calories in a way they like and can sustain, and focus on eating healthfully. If you embark on a weight loss journey that involves both adding exercise and cutting calories, Montclair's Thomas warned not to count those calories burned in physical activity toward extra eating. "Pretend you didn't exercise at all," she said. "You will most likely compensate anyway, so think of exercising just for health improvement but not for weight loss." This post originally appeared on Vox. This article is republished here with permission. I read through more than 60 studies on exercise and weight loss. I also spoke to nine leading exercise, nutrition, and obesity researchers. Here's what I learned. I've read many articles about the myth of exercise as weight loss, but none better or more comprehensive than this one. Such a great dissection of the evidence. Take everything here with a grain salt, but helps highlight how little we know about our own bodies. It's generally accepted that for most people, the basal metabolic rate accounts for 60 to 80 percent of total energy expenditure," Kravitz said. Digesting food accounts for about 10 percent. I can't outrun my diet. For some reason people still don't get it. What you eat is way more important to weight loss than exercise (but exercise is naturally an all good thing). Conclusion: Eat less calories and exercise regularly and you will be great! think of exercising just for health improvement but not for weight loss." So everything I know is a lie, cool. what science knows about weight loss and exercise. Váha (tuky) se neshazují cvičením. To bohužel běžná populace neví. Exercise found to do basically nothing to help weight loss. Whole foods plant-based is the way to go! Sugar is everywhere. Its an insidious a health hazard more damaging than the risk of second hand smoke. At least with smoke you can see it, smell it, and change course when it's in your face. While 100% of the energy we gain comes from food, we can only burn about 10% to 30% of it with physical activity each day. It's extremely difficult for people to lose weight once they've gained it by simply exercising more. A Cochrane Review of the best-available research found that exercise led to only modest weight loss, though exercisers do get a lot of health benefits. The exercise to lose weight myth. But note: These folks use physical activity in addition to calorie counting and other behavioral changes. Every reliable expert I've ever spoken to on weight loss says the most important thing a person can do is to limit calories in a way they like and can sustain, and focus on eating healthfully. A pound of human fat represents about 3,500 calories; therefore cutting 500 calories per day, through diet or physical activity, results in about a pound of weight loss per week. It's about the "in". Not that you don't know. Not that you're following the advice. But note: These folks use physical activity in addition to calorie counting and other behavioral changes. Exercise alone is almost useless for weight loss. It has myriad health and mental benefits but negligible effect on consistent, sustained weight loss. So the benefits of exercise are real. And stories about people who have lost a tremendous amount of weight by hitting the treadmill abound. But the bulk of the evidence tells a less impressive story. the time. Men typically go off and hunt — chasing and killing animals, climbing trees in search of wild honey. Women forage for plants, dig up tubers, and comb bushes for berries. "They're on the high end of physical activity for any population that's been looked at ever," Pontzer said. You are eating more than ever. You cannot outrun a bad diet. hmm. interesting read. please pass this on. Mano, que texto maravilhoso sobre a relação alimentação + perda de peso. More exercise than equivalent of 45 min. of daily fast paced walk, won’t help losing more weight. 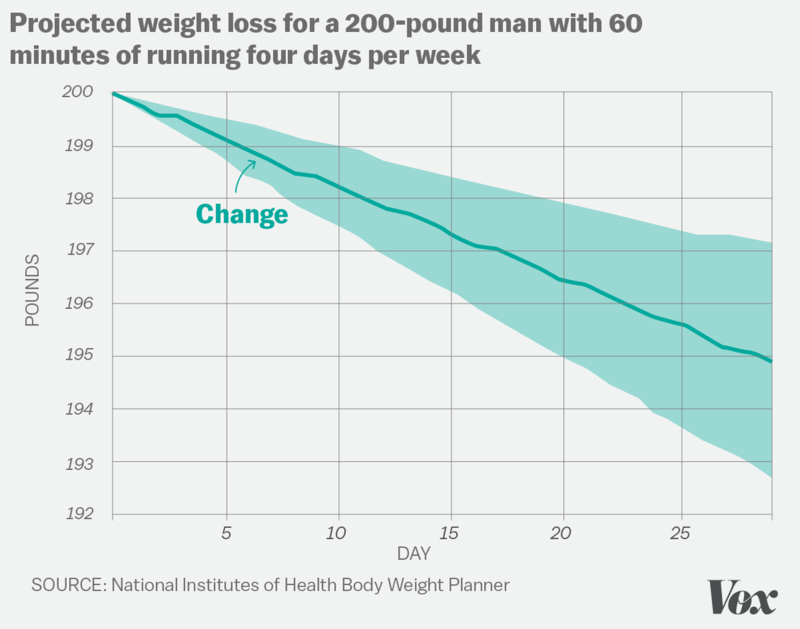 No change in eating habits, but weight-loss success will be elusive. Nothing I wasn't aware of but it's good to be reminded because it's so easy to delude yourself in day to day living. "You work hard on that machine for an hour, and that work can be erased with five minutes of eating afterward," Hall added. A single slice of pizza, for example, could undo the benefit of an hour's workout. So could a cafe mocha or an ice cream cone. I know this by experience. Back in college I rarely eat and hardly go to the gym. Thats when I lost the most weight. Shrnuti souvislosti mezi cvicenim, dietou a jejich vlivu na vahu. Exercise is really important, but it's not that effective for weight loss. The answer to good health is found almost entirely in eating. Really interesting. The body is way more complicated than we think but people like to think otherwise. Loved this article, so thoroughly explained! Ready to do some changes in my daily habits cause of it. When you alter one component — cutting the number of calories you eat in a day to lose weight, doing more exercise than usual — this sets off a cascade of changes in the body that affect how many calories you use up, and in turn, your body weight. Got a "whoa" moment on reading this.. Exercise won't be enough to make you shed pounds. Sounds intuitive but actually many subscribe to this belief. Exercising does not seem to be the best way to loose weight. It is more likely to be eating less and more heathy. What you eat, how much you eat. The plot thickens! Better star counting calories again. No matter how working out impacts your waistline, it does your body and mind good. This Cochrane Review of all the best-available evidence on exercise for weight loss found that physical activity alone led to only modest reductions. "It's generally accepted that for most people, the basal metabolic rate accounts for 60 to 80 percent of total energy expenditure," Kravitz said. Digesting food accounts for about 10 percent. And exercise, of course, has a way of making us hungry — so hungry that we might consume more calories than we just burned off. They might decide to lay down for a rest, fidget less because they're tired, or take the elevator instead of the stairs. These changes are usually called "compensatory behaviors"
But this focus on calories-out, or the calories we can potentially burn in exercise, is "an inadequate and a potentially dangerous approach, because it is liable to encourage people to ignore or underestimate the greater impact of energy-in," an obesity doctor and professor wrote in the journal Public Health Nutrition. For better health and wellbeing, exercise; for weight loss, eat less and better. This isn't something I want to hear, but it certainly makes sense of my experience. I will definitely use this to justify my shortcomings. Insightful and actually backed by data. Good article. Mental perception probably needs to change towards avoiding putting weight on in the first place as opposed to the current how to lose it once it's there. But note: These folks use physical activity in addition to calorie counting and other behavioral changes. Every reliable expert I've ever spoken to on weight loss says the most important thing a person can do is to limit calories in a way they like and can sustain, and focus on eating more healthfully. An excellent article on the true impact (or lack thereof) of exercise with respect to weight loss. A very useful and informative article about exercise and dieting. Por qué ni debes hacer ejercicio para perder peso... muy interesante. nearly impossible to change a single habit- why we tell people to lose weight by starting to diet and exercise is puzzling... two very difficult things to change on their own. seems we're setting folks up for failure.? Exercising just for health improvement but not for weight loss. An emphasis on diet has more effects. And pay attention to sleep and stress! Fantastic article that lists 10 good reasons why exercise doesn't really help you lose weight. 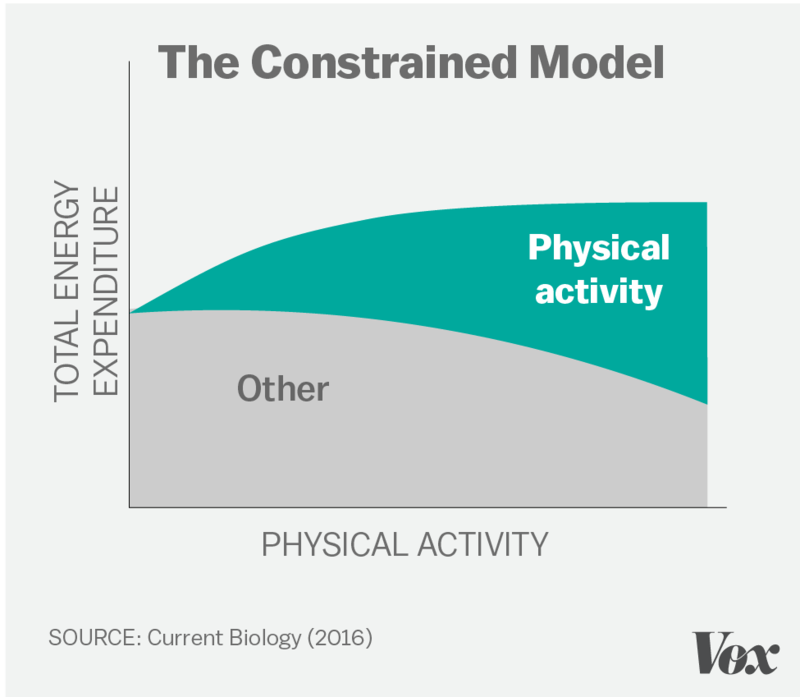 the "constrained model" of energy expenditure, which shows that the effect of more physical activity on the human body is not linear. In light of our evolutionary history — when food sources were less reliable — he argues that the body sets a limit on how much energy it is willing to expend, regardless of how active we are. "However, if you're trying to lose weight, the biggest problem I see is food. We need to cut back the food we're eating." The evidence is now clear: Exercise is excellent for health, but it's not important for weight loss. we always thought exercise could control weight. Think again...the facts support better health, but weight control is not one of them. Who'd a thought? Exercise is excellent for health, but it's not important for weight loss.